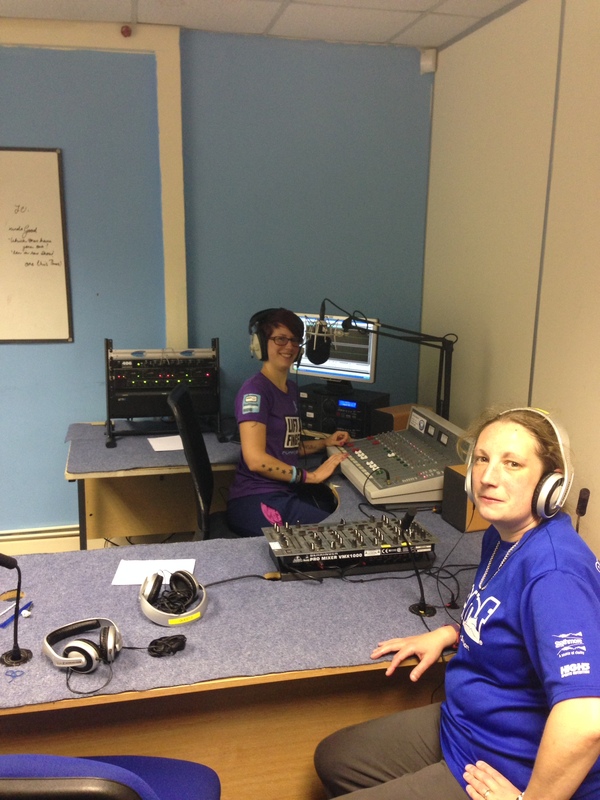 My radio show running on air has been broadcasting for a few weeks now on South Leeds Community Radio. I have been enjoying making it and already I have been getting some encouraging feedback and involvement from other people. 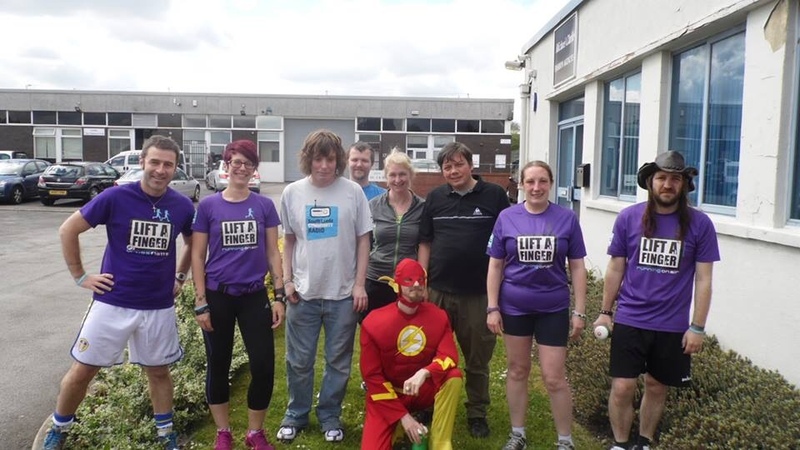 Alongside the radio show I am running a group for people to get started with running, and last week was the first session. I was a bit scared about how it would go and if anyone would turn up, but it was fab! Jill joined me to record my show in the morning and then stayed to help me with the group. As we were getting ready to go my friend James put in a surprise appearance – complete with a tin of his yummy Ginger Crunch for us to enjoy afterwards! Big thanks to you both for support – it was much appreciated. 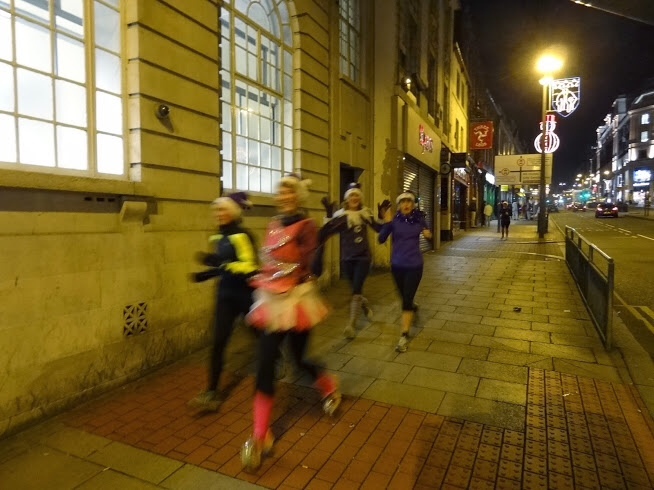 Most of the group were fellow volunteers from SLCR who had been cajoled into coming along, and there was one lady who, although already a runner, was seeking additional support and guidance. She had heard about running on air through a friend, who in turn is a friend of a volunteer. So our little group headed off towards Cross Flatts Park. It’s about a 10-minute walk, so we chatted on the way, and then did some warm-up drills when we arrived. Then it was a 1-minute walk, 2-minutes jog session, covering a mile in total to celebrate the 60th anniversary of Roger Bannister’s four-minute mile. We did our mile in 13:46, so we now have a benchmark to improve upon. After some stretches we walked back to the station for snacks and pats on the back. Everyone did really well, and there were a couple of people in particular who surprised and impressed me. They all said they had enjoyed it and promised to come back. Some were even asking about races and there were parkrun sign-ups going on while we were still there! It was really fun for me to share something that I enjoy so much, and it was great to help others discover the joy of being active. I’m excited to see everyone progress over the next few weeks and months, and I hope they continue to enjoy their running journey with me. 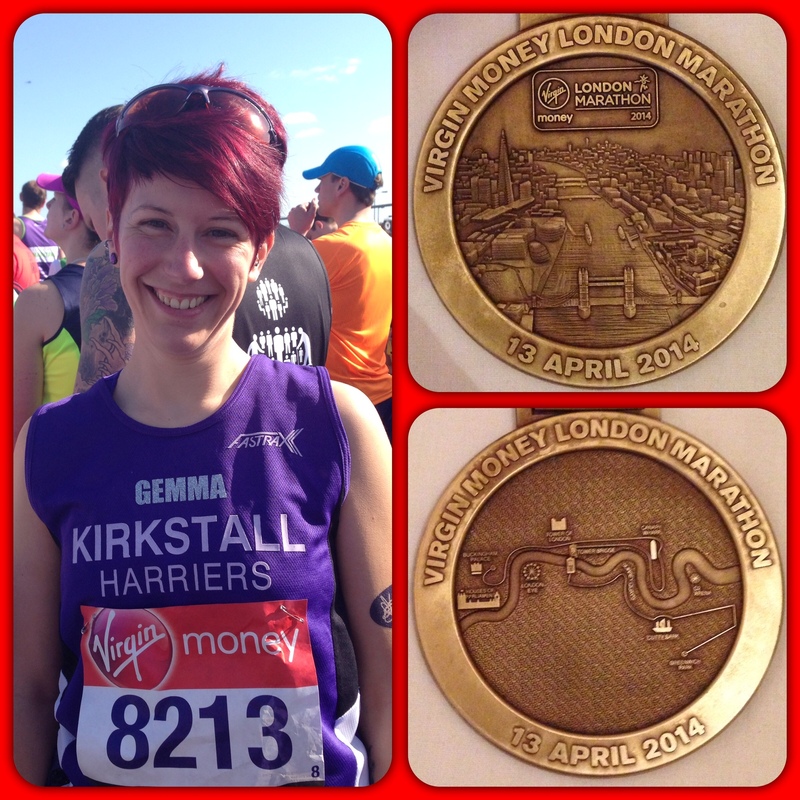 On Sunday 13th April I (mostly) ran the London Marathon. It was a unique and interesting experience. And I have no intention of ever repeating it. 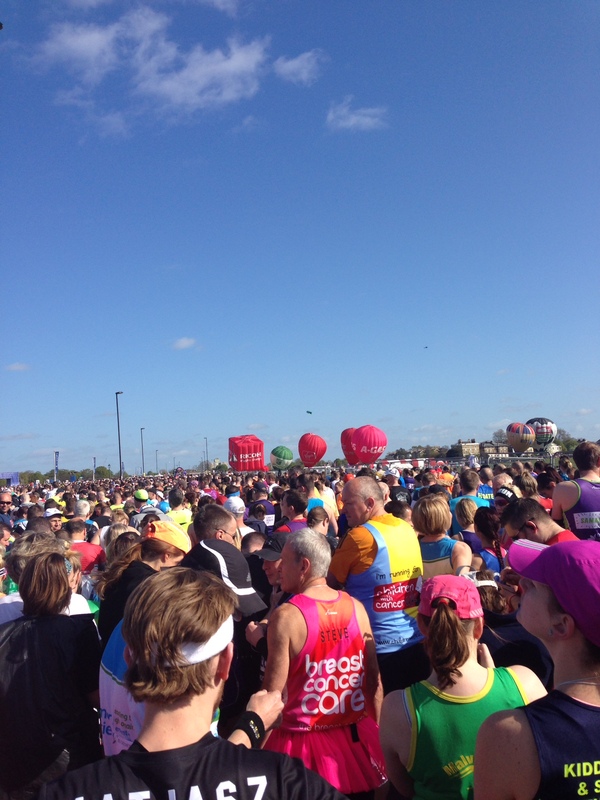 What follows is a haphazard account of the build-up, the race and my thoughts and feelings. 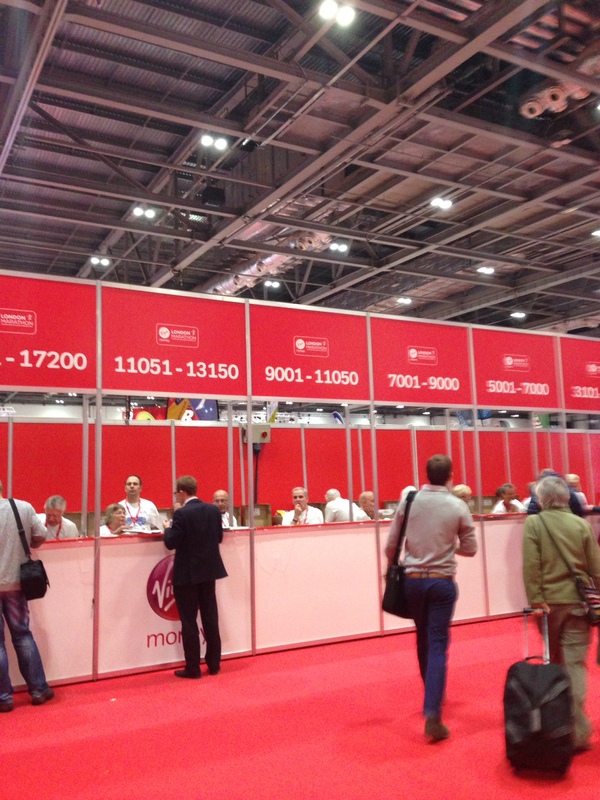 I travelled to London on the Friday to give myself plenty of time to visit the expo to collect my number that evening, and have a relaxing day on Saturday. 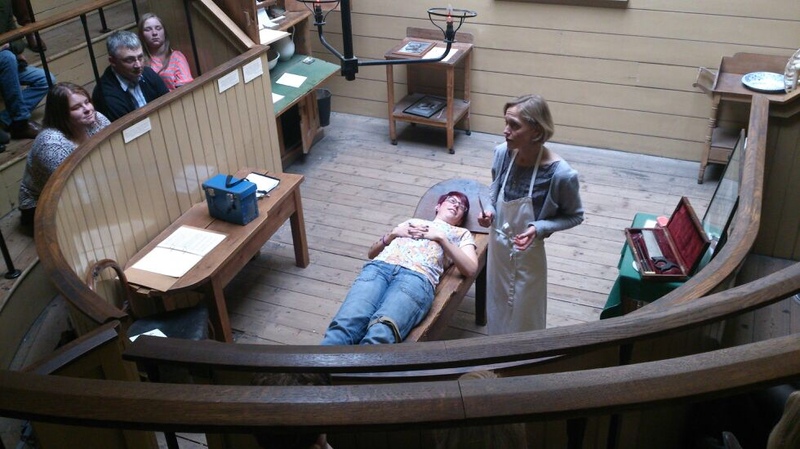 The plan worked out marvellously – Rose and I wandered through the expo without incident (and without spending very much – I just stocked up on gels) and I went to the Old Operating Theatre Museum on Saturday, which was marvellous and not too tiring. I volunteered to be the “patient” so the historian could demonstrate an amputation – I told her about the marathon though so she made sure I survived the procedure! By Sunday morning I was feeling much calmer about the marathon and had decided that I wouldn’t try to do it in under 4:30. That just seemed silly and there was no need for me to go chasing after a time – it would be much more enjoyable if I just ran for the experience. I am glad I decided on this. I got to the start area in plenty of time, coffee in hand, and straightaway bumped into my running club friends Emma, Jill and Graham who were helping out on the water stands. This meant we had a convenient meeting point so I also got to chat with Burjor, Jason and Kieran, and I spotted Lucy in the toilet queue. The friendly faces, plus the masses of room in the park and the good weather made for a very chilled out 90 minutes before the race. In fact, it was probably the most relaxed I have been before a race! Fantastic! In the start pen I bumped into someone I know online so more friendly chats to keep the nerves in check. And soon enough we were off. It took about 14 minutes to get to the start line, and straightaway there was plenty of support from the spectators lining the route. The sun was shining, music was blaring from various houses, and all was good with the world. I really enjoyed the first few miles and couldn’t stop grinning. 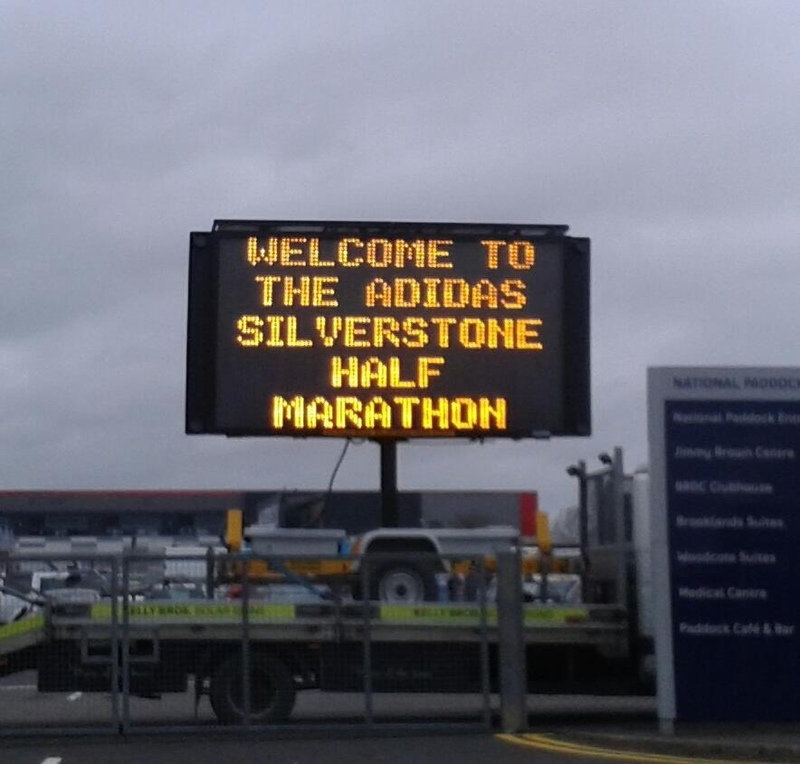 Here I was, my first ever marathon and I was running it in London. What a thing! I stuck to my fuelling plan and avoided the temptation to drink loads at each water station. I ran just as fast or as slow as I felt like running, happily accepted jelly babes off firemen, high-fived various kids and did my best to soak it all up. The miles added up and before I knew it I was running over Tower Bridge, which brought the first tears to my eyes. 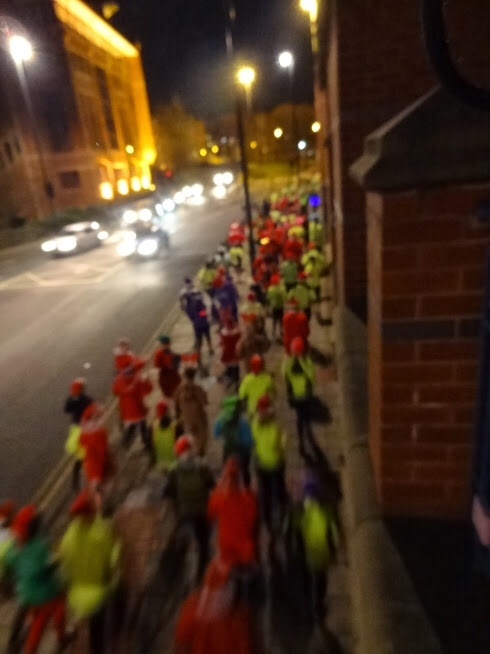 Soon after it was about halfway and I spotted the Kirkstall Harriers support crew on the opposite side of the road so gave them a good wave. At this point the route starts to get a bit bendy, and I think this is where I began to lose it a little. The noise was just phenomenal. 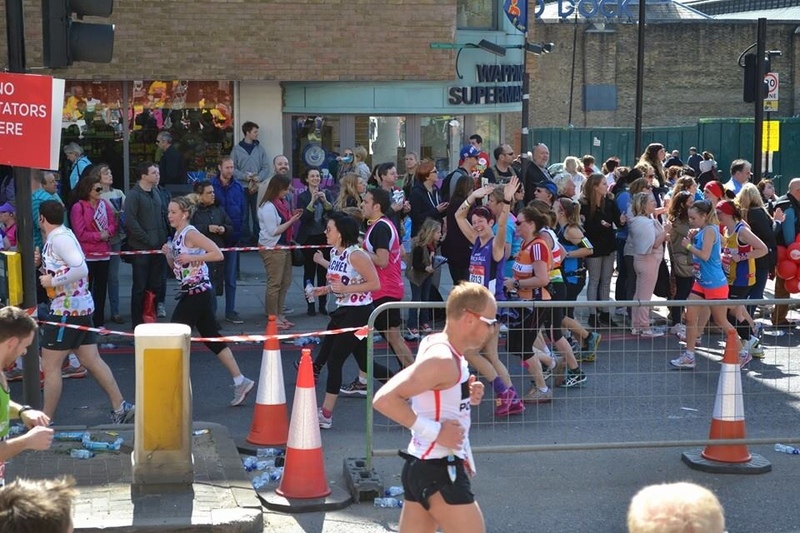 I couldn’t see more than half a metre in any direction except for straight up because of the sheer amount of bodies around me, both runners and spectators. It was sensory overload. People were clapping, shouting names, whistling and whooping. Various styles of music came and went, from brass bands to Led Zeppelin. Sweets were being thrust at me from all angles, and everywhere I looked there were crowds of people drinking, waving banners and jumping up and down. I felt like a molecule of water being carried along with the current. I was simply a small part in a mass race and there wasn’t room, time or mental capacity to run my own race, let alone enjoy it. I couldn’t hear myself think, and consequently I couldn’t concentrate on my form or even give myself a pep talk. Everything was INPUT INPUT INPUT, with so much going on externally that I couldn’t do anything about what was going on internally. Intense does not even begin to cover it. I started to slow considerably by about mile 17, and from mile 20 onwards there was a lot of walking. This didn’t bother me in the slightest – I was glad to just be going forward and not fussed about whether it took me another hour or three to get to the finish line. Add in the fact that it got very narrow in places, and that a lot of other people were walking, then jogging a bit, and it made for a very stop-start final third. I ran the last mile or so, doing my best to ignore the noisy crowds, have a look at the Tower of London, the Eye and Parliament and give Her Majesty a quick wave. I crossed the line in 5:27:29 and was absolutely elated. I shed a few tears as I received my medal and tried to comprehend what I had just done. There were many times when I was enjoying myself. And many times where it really hurt. As usual, I put on a good show for the snappers and am smiling and skipping along in most of my official photos. I could grab on to small moments every now and then to relish the experience and realise what I was achieving, but as a whole the race went by in a blur and overall it wasn’t that much fun. 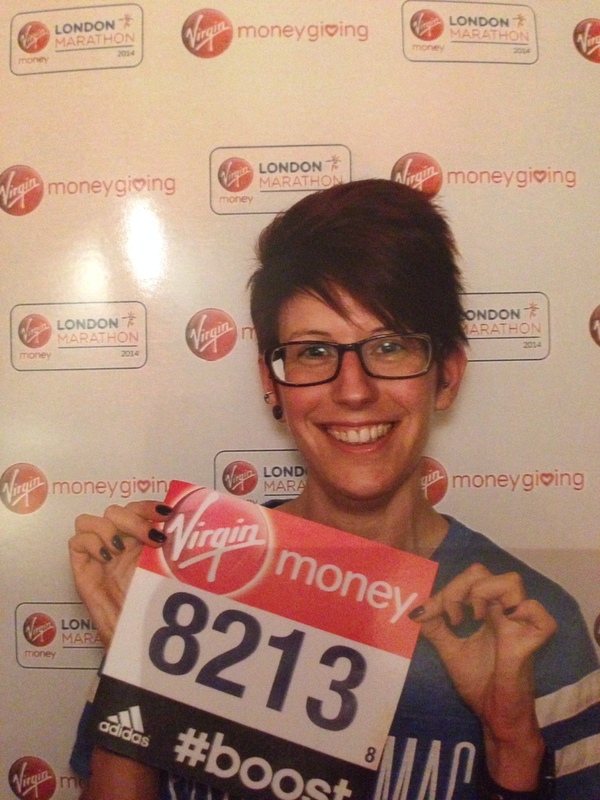 I just wasn’t a part of the London Marathon 2014. I was there in body, but not in mind. It was so lonely. I was simply part of something that was bigger than any of us, and as a result had no real individual identity in it. It took me until Monday evening to properly look at my stats – I simply wasn’t bothered because I had finished it in one piece, and that was all that mattered. I did it and I am super proud of myself. But I won’t be running London Marathon again. I loved the distance and I felt that I could have gone on running even longer had I needed to, so I have no worries about doing more marathons and ultra-marathons. But next time I need fewer people and greener surroundings. 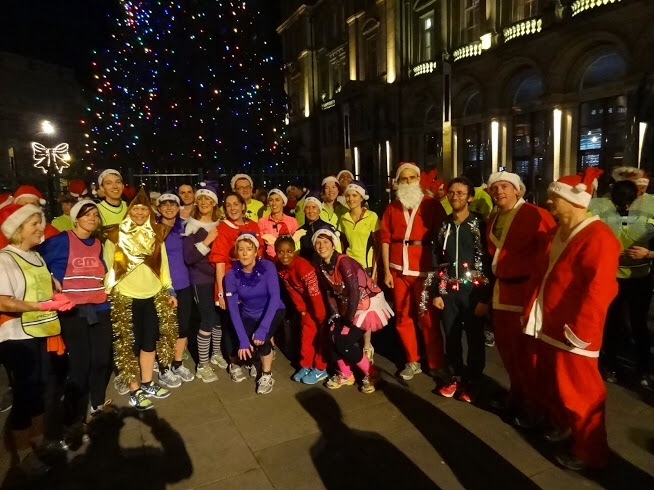 This week at Kirkstall Harriers we hosted our annual Christmas Lights Run. 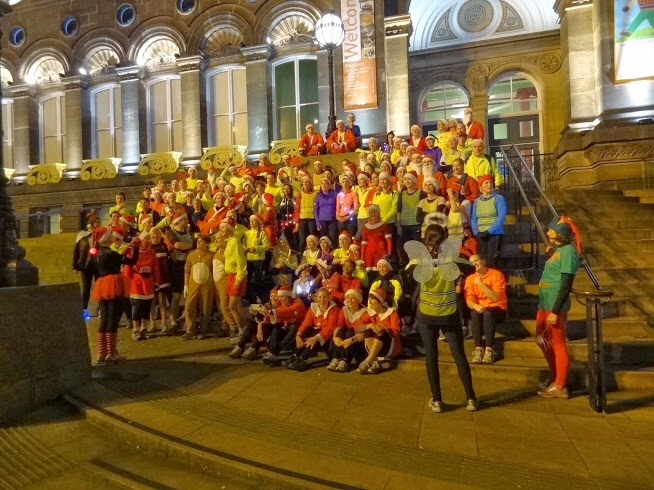 We invite our running club neighbours Horsforth Harriers, get dressed up and go for a run around Leeds city centre to marvel at the festive-ness. And afterwards we scoff a lot of food at our HQ. As much as I love any opportunity to wear fancy dress I have to admit my outfit was a little tame. 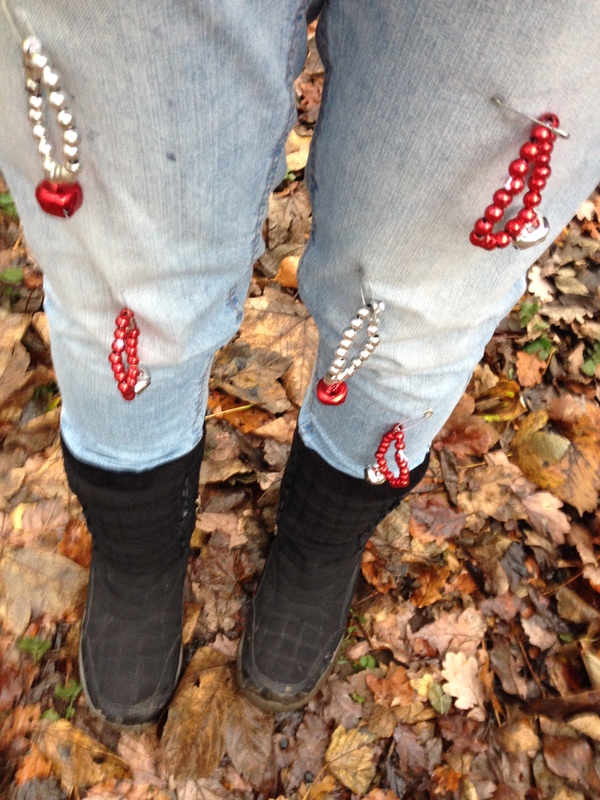 By which I mean I didn’t really dress “as” anything – I just draped Christmas decs around myself. 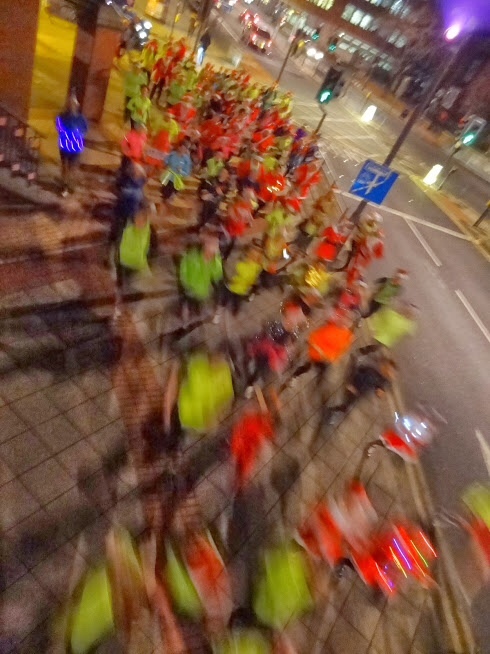 We were expecting a decent turnout – it was a great evening for running – but to get more than 120 runners was fantastic! 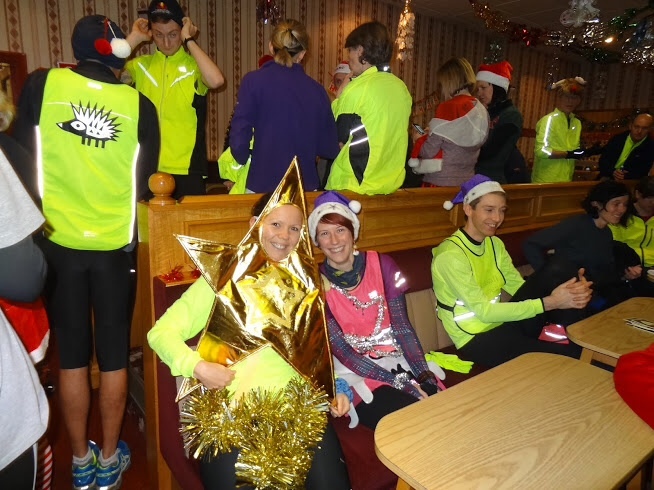 This is what such a gathering of festive fancy dress runners looks like. We ran 6.75 miles in just over 1:12 according to my watch, which isn’t bad going for a weekday evening. And, good runners that we are, we made sure not a single crumb remained of the buffet. On Saturday I went to Cross Flatts parkrun for the first time. 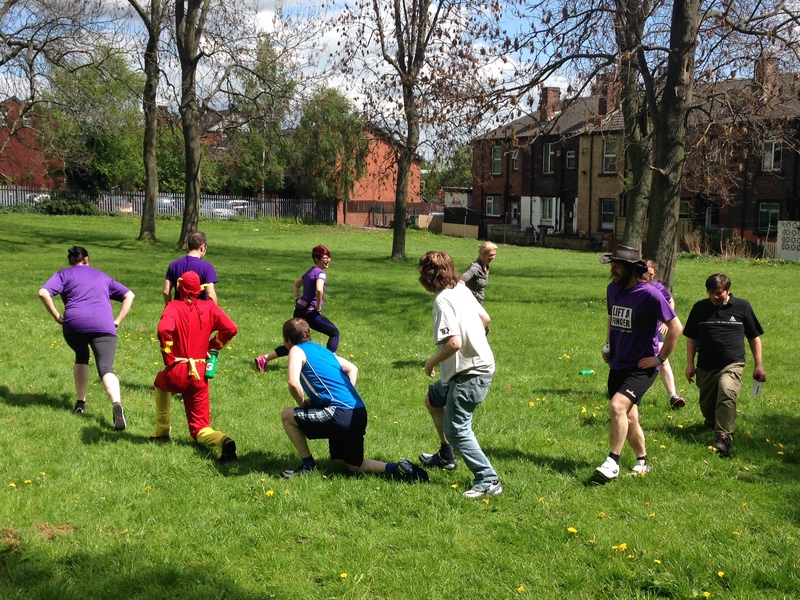 I am competing in the Leeds Race Series and points can be gained at each of our four parkruns in Leeds over certain weeks. 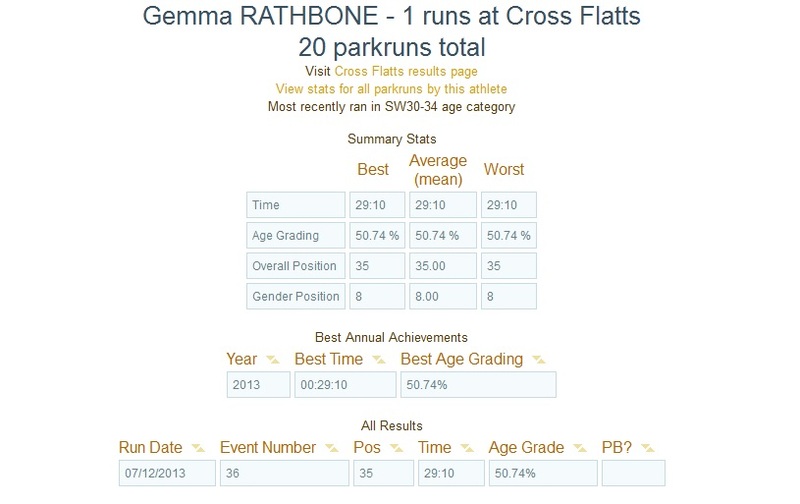 Cross Flatts Park is a great venue, and it has a much smaller field of runners than our other parkruns, which means it is easier to get a good start and go straight into your pace. I wasn’t too sure about the course or its PB potential so I just headed out at what felt good and took it from there. Because there weren’t as many runners there were far fewer opportunities for chatting along the way, but that was fine – I had one headphone in and I just thought about my feet. The route was pleasant and there is only a small incline with a few steps in the middle. I’ll be back at the end of the month for my last PB attempt of 2013. 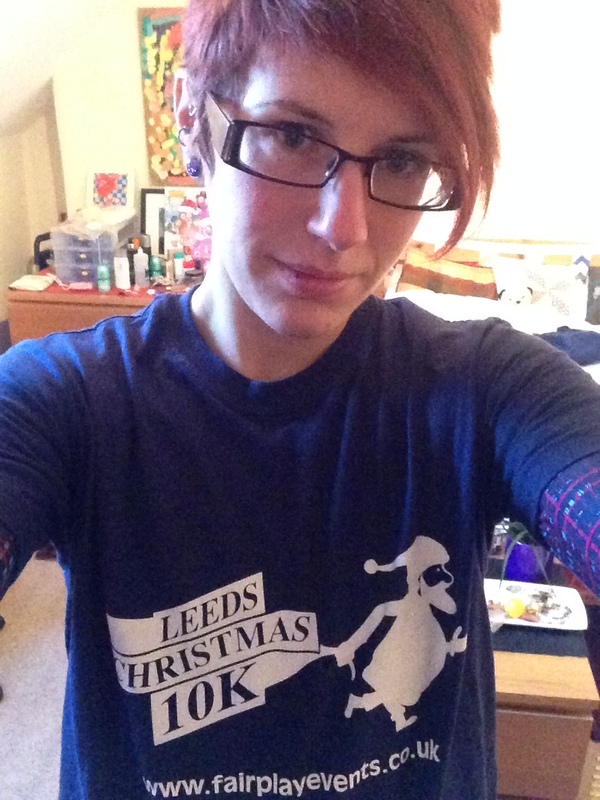 On Sunday I marshalled at the Leeds Christmas 10k. I ran this race last year and really enjoyed it, but as I have done so much recently I decided I would go along to help out. 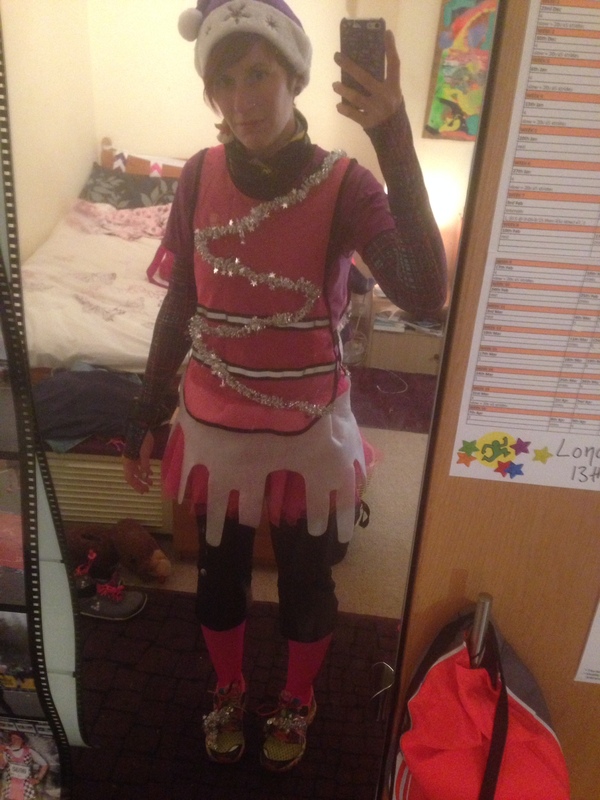 The fact that fancy dress and being loud was a job requirement also helped my decision. 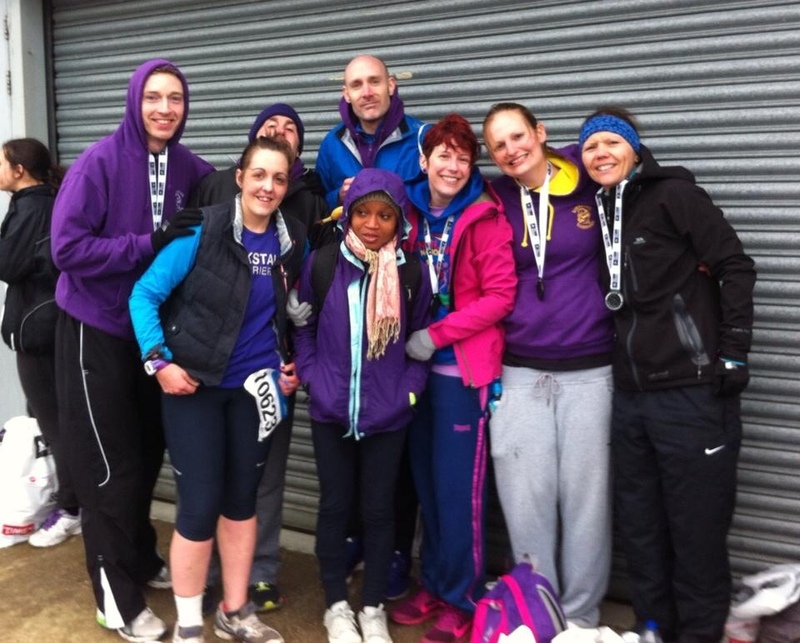 I rocked up to the John Charles Stadium where the race started and finished and found a lovely bunch of people all there to ensure the race went smoothly. 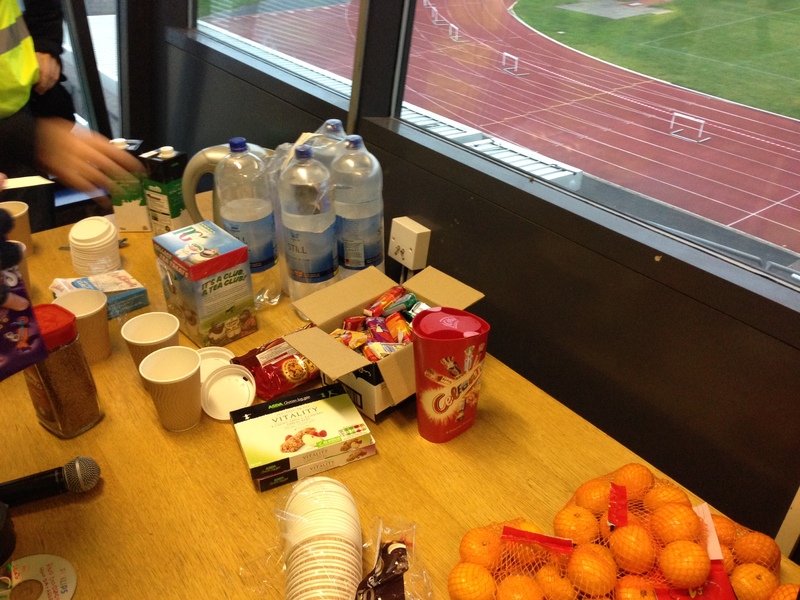 We assembled in the announcer’s box at the top of the stand, where we had plenty of goodies to keep us going. My marshal point was about half way round the circuit in the woods, of which the runners did three laps before returning to finish at the stadium. The lead runners got to me in under 10 minutes, and after that there was a constant stream of them for over an hour. I greeted them looking like this, and making a lot of noise. I channeled my inner Morris dancer and pinned bells to my legs, then I had a pom-pom in one hand and a tambourine in the other. 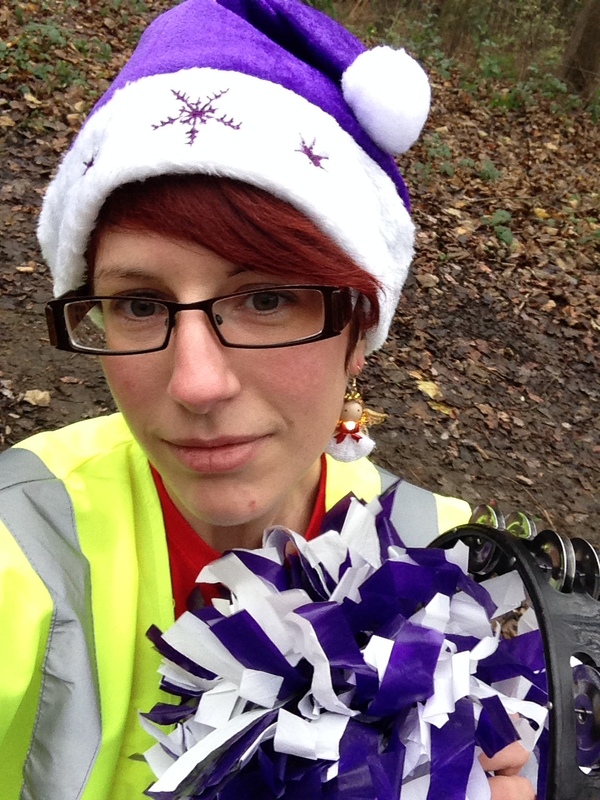 Add in my purple Santa hat, hi-vis vest and jumping around and shouting rather manically I must have been quite a shock as they came along the path towards me the first time. 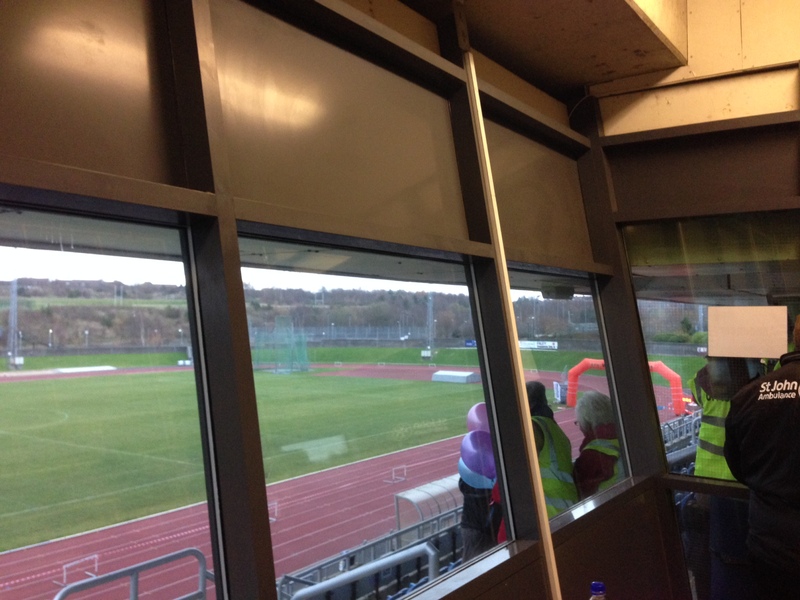 By the third lap I fear some runners may have been going slightly deaf! But hopefully they also appreciated my efforts to help keep them going. Several people commented that they were glad of my energy and enthusiasm, especially as I was just at the bottom of a short hill. I ran up the hill quite a few times with some of the runners. Oh, and I saw several Father Christmases, all of whom promised to bring me kittens! I finished my shift very tired but having had a wonderful time. 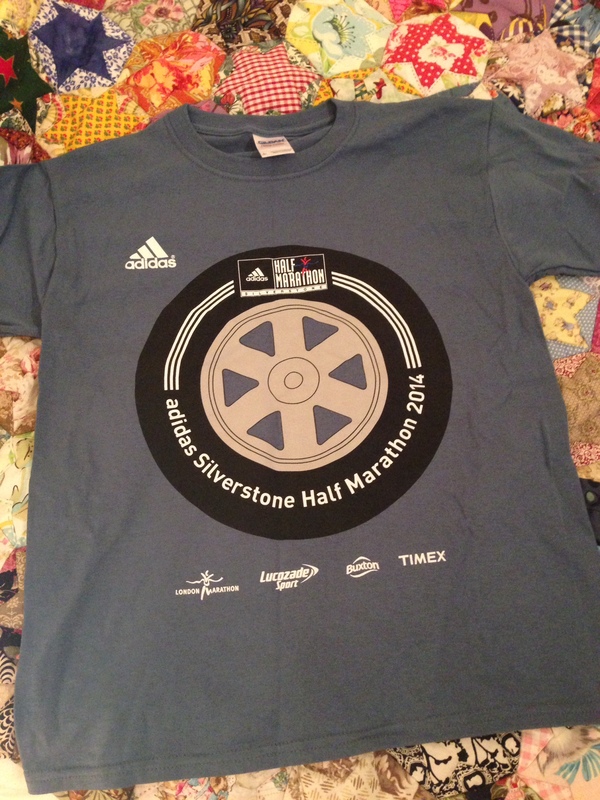 The lovely organisers even gave us a race tee for helping out. 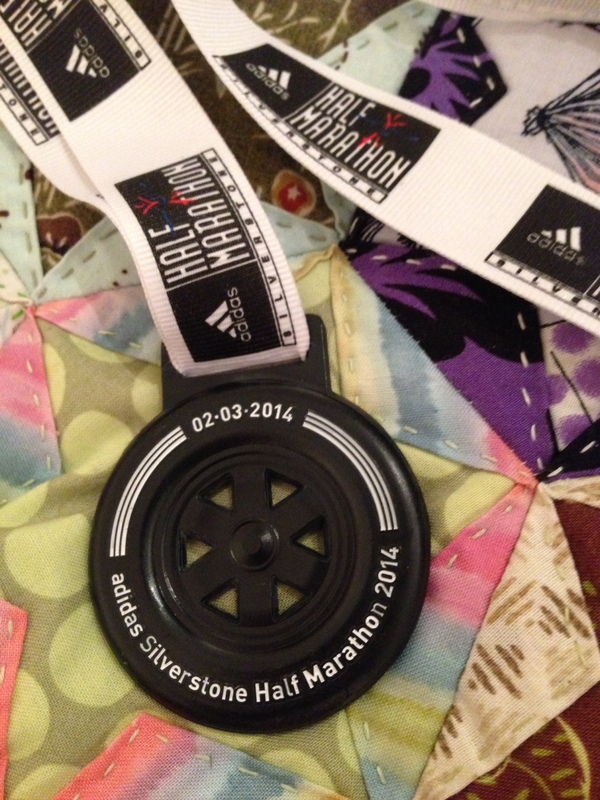 I can highly recommend this race – either to run or to marshal. 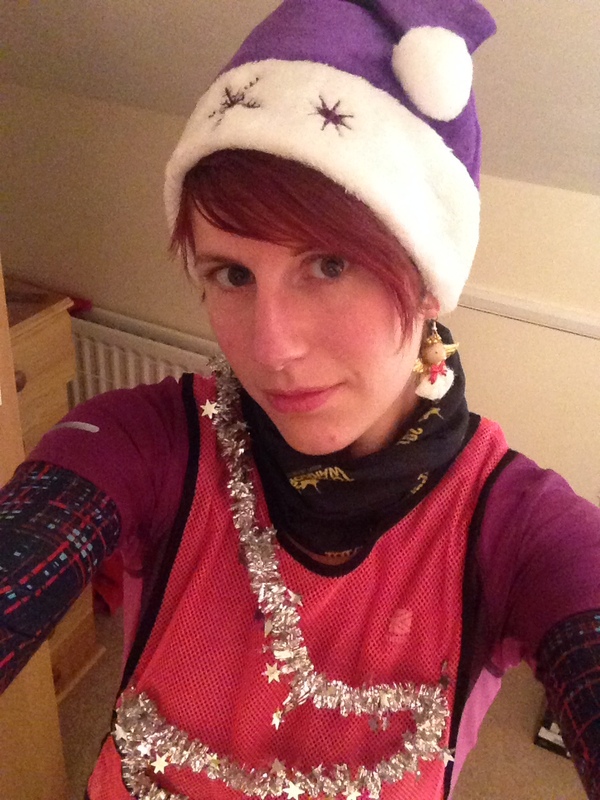 It is a challenging course, but there are mince pies at the finish so you have to earn them! Big thanks to the organisers for their hard work in creating a great event, and also well done to my fellow Kirkstall Harriers who took part. 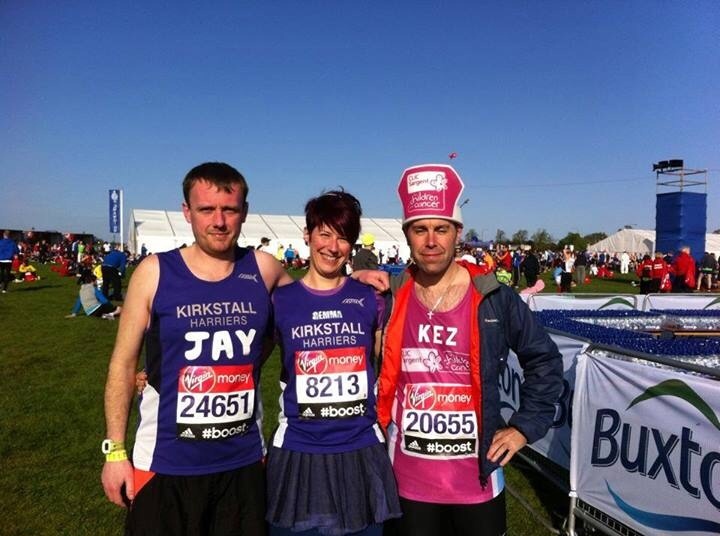 The running community is the most inclusive, welcoming, supportive and encouraging that you could hope to find. I am often overwhelmed by the absolute awesomeness of my fellow runners and their willingness to give advice, hugs, time and support. Sometimes they even share food, and that really is special! When I first started running I had no idea there was a whole world dedicated to it. I thought clubs were the realm of fast, lean runners who ran to win. Not wobbly, slow runners who had never run further than six miles. 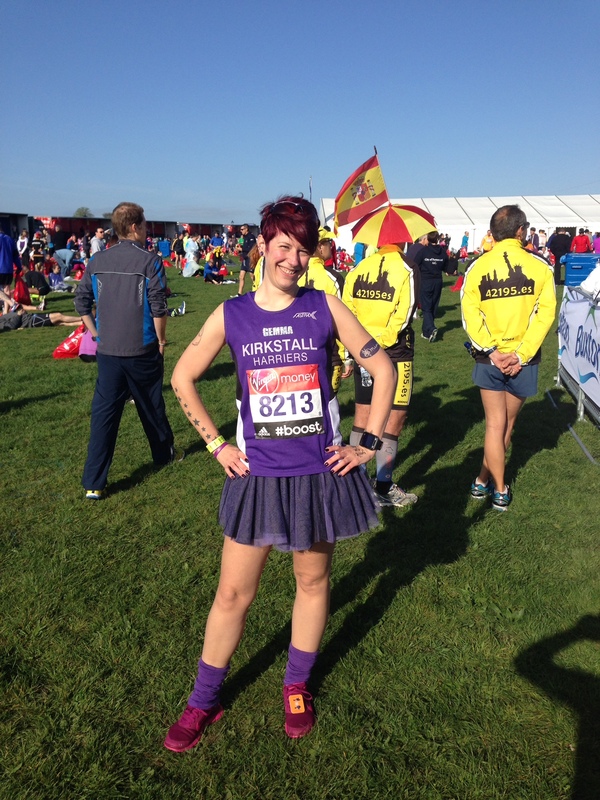 But as soon as I plucked up the courage to go along to a training session with Kirkstall Harriers at the start of this year I realised that running really is for everyone. 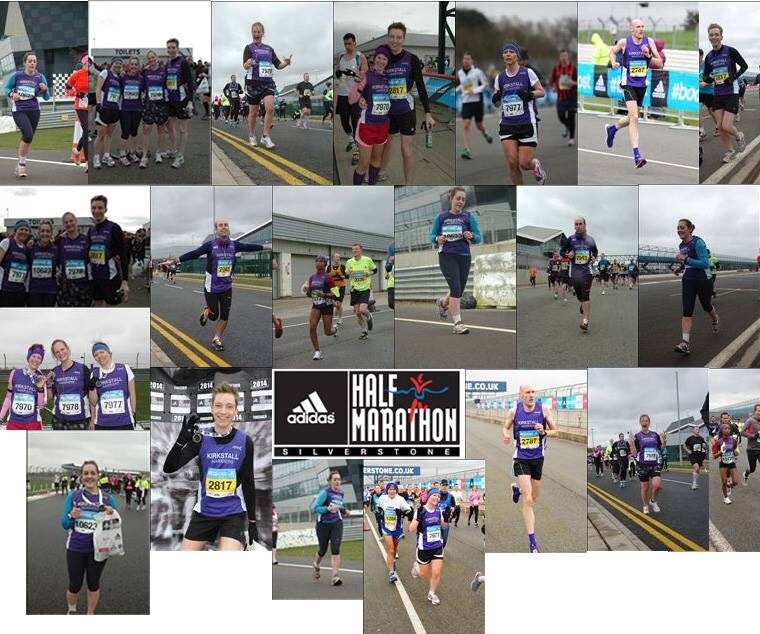 We are truly a diverse bunch of people in our purple posse – from students to pensioners, from all backgrounds and all walks of life, from those who love a 5k, to those who have done more than 100 marathons (yes, really). I challenge anyone to show me a more mixed, interesting and friendly bunch of people, and I think that goes for the running community in general. I love that a shared enjoyment for something as simple as running can bring together all sorts of people. I am impressed, amazed, inspired by and sometimes saddened by the things I learn about, and from, my fellow runners. When we run we end up talking about anything and everything. And quite often, a lot of nothing too. We share things, we gossip, we natter and preach and teach and moan. This is becoming a bit lovey-dovey, but running really is so ace and it gets under your skin. It’s more than just something you do alone for a few hours each week to tick the exercise box and justify an extra biscuit with afternoon tea. It’s more than just huddling together for warmth with club mates on a cold, dark night. It’s more than getting quicker or drooling over pretty new shoes. Running is a local and global community that unites people who all recognise, and relish, that innate drive to achieve a natural high that comes from within. And I, for one, love it.